Epigenetic Research for Space Exploration | What is Epigenetics? Sixty years ago this October, a tiny little beach ball-sized satellite named Sputnik would usher in the beginning of the space age. Since that time, several space exploration achievements have transpired and many have included humans traveling in space. But humans weren’t exactly meant to live in outer space. Our bodies are uniquely adapted to the Earth’s gravity and environment. So if we want to travel longer distances into space, Mars for example, then we need to know how the space environment will affect the human body on such a long trip. Knowing this will possibly allow us to develop ways to prevent, or even reverse, any harmful effects from occurring. One area of research that scientists are keen on investigating is epigenetics. Epigenetics looks at how internal and external environmental factors affect DNA in a way that changes gene behavior, but does not alter the underlying genetic code. Stimuli such as diet, exercise, and stress can chemically modify DNA or adjust the way it’s packaged, thus determining whether genes are switched on or off. These alterations can have an impact on biological functions, causing any number of health conditions. For instance, certain epigenetic mechanisms are associated with many cancers and other diseases, as well as aging, and psychological disorders. Agents such as pollutants, viral infections, hormones, and drugs have been attributed to promoting epigenetic modifications. Since most of these changes are established by enzymes or proteins, they are potentially reversible, making epigenetic information a promising target for the development of novel therapeutics. For years, scientists have been studying the effects of space on humans. They know that microgravity, for instance, causes bone and muscle loss, and that the lack of a 24-hour day/light cycle causes sleep and performance problems1. Microgravity is the condition in which people or objects appear to be weightless. The effects of microgravity can be seen when astronauts and objects float in space. There’s also the issue that increased exposure to cosmic radiation could lead to coronary heart disease, cancer, or other ailments2,3. While certain measures are being taken now by astronauts to prevent or at least lessen some of these health issues (e.g., exercise to prevent bone and muscle loss), there’s still concern whether long-term exposure in space might be too detrimental for humans. Epigenetic information allows us to explore what is happening to the body on a molecular level during space travel. Moreover, it can potentially help determine ways to keep humans healthy for extended stays in space. There are several space projects currently being conducted both on land and at the International Space Station (ISS) investigating epigenetics. A few in particular which are all taking place on the ISS are highlighted here. Although their results may be only preliminary, the information that these studies are providing is invaluable. Plus, the opportunity to conduct these epigenetic experiments on such a unique, microgravity platform could lead to breakthroughs not possible on Earth. Years before humans ever ventured into space, animals were used to test the safety and side-effects of space travel. Researchers continue to use animals today to understand the effects of space. Current studies on mice, in fact, have provided valuable data for epigenetic research. Evaluating how these mammals (who share about 97.5% of their working DNA with us) are affected biologically at zero gravity elucidates the possible human physiological effects of space travel. It will be interesting to see the result from this study, as previous data obtained on the ISS to validate the research capabilities of its new rodent habitat hardware system showed that mice subjected to microgravity exhibited normal behavior. While in space, the mice reportedly showed no visible signs of stress or weight change, and their biological samples taken upon return were of acceptable quality for molecular biology methods and gene profiling. Because epigenetic markers are of considerable importance to many of NASA’s human research projects, a bisulfite-based RNA-seq analysis in which contractor EpiGentek looked for 5-methylcytosine (5-mC) changes in the transcriptome was conducted. The data from this and other proteomic and epigenomic feasibility studies are available for review online. At approximately 1 mm in length and transparent, the roundworm known as Caenorhabditis elegans (C. elegans) might seem like an unusual species to study on the ISS, especially in regards to understanding human health concerns. Yet, because of the fact that C. elegans are arguably the most described animal in scientific literature and can be easily manipulated genetically, they really are an ideal choice for understanding the epigenetic effects of space. Studies on this specific animal have been done more than a few times in the past 10 years. In the course of these investigations, researchers initially discovered that space flight induces changes in gene activity – particularly affecting the muscle- and metabolic-related genes. In addition, histone deacetylase genes were found to be stimulated in the roundworms while in space. The working hypothesis from these results is that microgravity produces epigenetic changes. Researchers are looking to verify these results with additional studies, but it could help explain why humans have difficulty maintaining muscle and bone mass in space. The researcher’s proposal stated, “If epigenetic changes occur in response to microgravity and it leads decreases in muscle and metabolism in the spaceflown C. elegans, it strongly suggests that similar epigenetic changes probably occur in humans” 5. Bone and muscle loss are challenges facing not only astronauts, but people on Earth as well. Proper exercise isn’t always an option to counteract this type of condition. If the roundworm experiments can help determine if these losses arise due to epigenetic shifts, then it’s conceivable that medicines or other therapies can be found to offset these losses. Expedition 45/46 Commander, Astronaut Scott Kelly along with his twin brother, former Astronaut Mark Kelly. Photographer: Robert Markowitz. Credit: NASA. The most notable study involving epigenetics in space is NASA’s Twins Study. From 2015 to 2016, astronaut Scott Kelly spent nearly a year in space while his twin brother Mark (a retired astronaut) stayed on Earth6. Before, during, and after Scott’s trip, biological samples were taken from each brother and compared to distinguish epigenetic changes as a result of the conditions Scott underwent such as lift off, weightlessness, increased radiation, defined diet, etc. As identical twins with similar life experiences, Scott and Mark share nearly the same DNA. Therefore, presumably any changes found in Scott’s genes can be attributed to his unique situation and the stressors he endured during his visit to the ISS. Scott and Mark participated in a total of 10 individual studies. The epigenetic ones involved looking at the twins’ telomeres, or the end caps of the chromosomes, along with changes in total gene expression. Specifically they looked at DNA methylation which is the most common epigenetic signaling tool. In the initial findings, the scientists were surprised to find that Scott’s telomeres, which are associated with aging, grew longer than his brothers. “That is exactly the opposite of what we thought,” says Susan Bailey, a radiation biologist at Colorado State University and principal investigator of the telomeres study7. The increased stress upon the body in space for such a long duration suggests that the telomeres would be shorter, so the evidence is somewhat puzzling to Susan and her team. One assumption is that the growth could be attributed to Scott’s increased exercise regimen and restricted diet. However upon Scott’s return to Earth, his telomeres began to shorten again to a size that would be normally expected. More studies are underway to determine what exactly the telomeres changes mean and what caused the unusual modification. 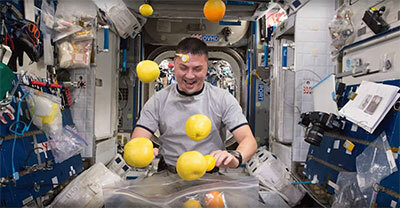 In the gene expression study, it was found that Scott’s level of methylation (or the addition of a chemical marker to DNA) within his white blood cells decreased while on board the ISS8. This change in DNA methylation included a gene that regulates telomeres. And just as his telomeres length reestablished, gene expression was also restored to normal after he returned to Earth. In contrast, Mark’s methylation on ground increased midpoint during the study, but also returned to normal in the end. 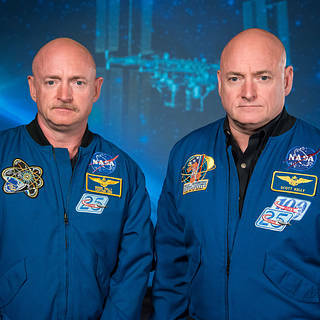 While variability was observed in both twins during the year-long assignment, Scott’s epigenetic noise aboard the ISS was somewhat higher than Mark’s. These results may also point to certain genes that are more sensitive to a changing environment whether in space or on Earth9. There’s still more to come from the Twins Study, as researchers incorporate these early findings in conjunction with other physical, psychological, and technical examinations. A joint summary publication, along with individual investigator research articles, may be available later this year. Nonetheless, it may take years to completely put together the data from this extraordinary mission. All the epigenetic studies being conducted in space, it is hoped, will advance our understanding of how the space environment affects the human body. If we intend to send people to places like the Moon or Mars, or on longer space expeditions, then we need to be certain that they will make their journeys safely and execute their missions appropriately. The benefit of space travel research does more than just fulfill our objective to continue human exploration into space. It also has important implications for earthbound humans, too. The results from the studies mentioned here may take some time before they can be fully presented to the public. Though we can only anticipate that these and other epigenetic explorations will allow humans to regularly travel among the stars in the future, as well as help us live longer, healthier lives in space and on Earth.